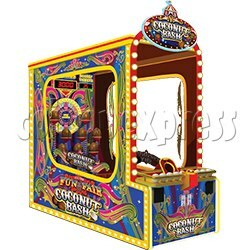 Coconut Bash Redemption Machine is a redemption game which knock down the coconut to win the scores, the game feature with the Bonus Wheel which when accumulate enough scores will be triggered. Machine design with a 10 ft deep cabinet, heart-stirring artwork and even more outstanding RGB LED lighting to catch everyone's eye and attention. Player aim for erect coconuts for the target, throw the ball to knock down the coconut to win the scores, and player as many as possible flatten the coconuts in the limited time to win more scores, accumulate enough points to activate the Bonus Wheel win the grand prize. When the game over, according to the winning scores reward the corresponding tickets.